← Join Hump Day $50 Giveaway: Like Us on Facebook! We were surprised to see a new restaurant at the place formerly occupied by Hyphy’s at The Veranda at Robinsons Galleria. The place is Blackbeard’s Seafood Island. 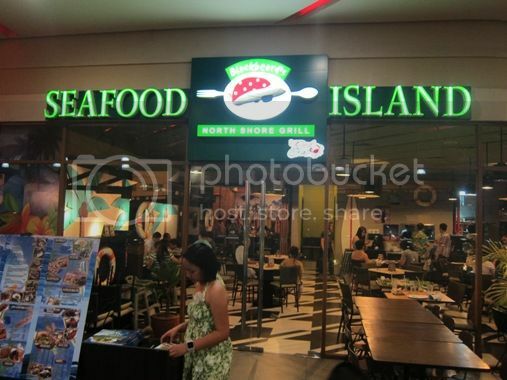 The place sounds familiar, so I asked one of the staff if this is the same Seafood Island at Market Market, and indeed it is. It was nice to see the staff all dressed in Hawaiian costume, and it actually gave me the feeling that we were in for a festive treat. Our server suggested that we try their Tali Beach, but we liked the dishes included in their Boracay’s Feast, so that’s what we ordered. 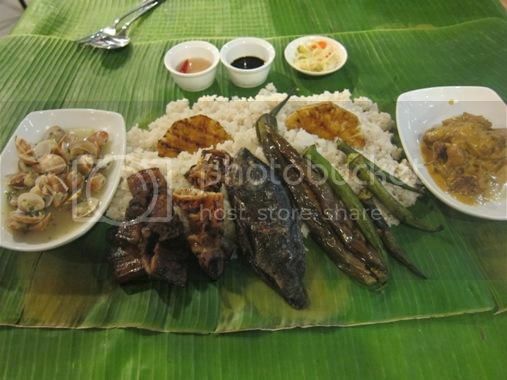 Boracay’s Feast consists of San Mig clams, grilled liempo, chicken adobo sa gata, grilled squid, grilled tilapia, grilled talong, okra, grilled pineapple and bagoong rice. The first thing we noticed was the small serving of all the food included in this boodle feast. There were only a few liempo slices, four small pieces of chicken, several pieces of clams, 1 squid, 1 tilapia, 2 eggplants, 3 okras and 2 pineapple slices, but there was a lot of bagoong rice! First off, the San Mig clams tasted like ordinary clam stew. They were also served cold. The liempo tasted okay, but there was nothing extraordinary about the chicken adobo sa gata. All the grilled foods were fine, but I liked the grilled pineapple slices the most. We finished everything except the bagoong rice. 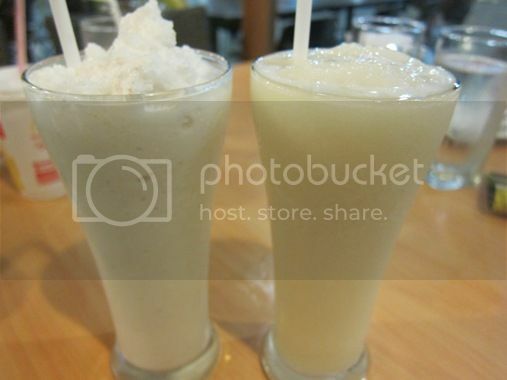 Hubby enjoyed his guyabano shake, but my buko shake needed more Splenda. I think the Php685 Groupies Promo that we had at Giligan’s was a lot better than Blackbeard’s Seafood Island’s Boracay’s Feast in terms of taste, serving size, and price. 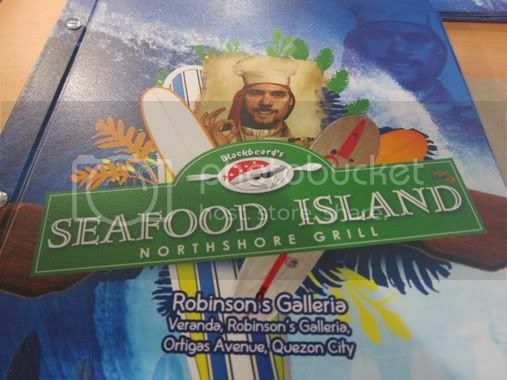 This entry was posted in Asian Cuisine, Blackbeard's Seafood Island, Boracay's Feast, Filipino Cuisine, Food Friday, Food Trip Friday, Restaurant Review, Robinsons Galleria. Bookmark the permalink. i think it’s a must-try, my kids would love it. Happy food trip friday! i’ve been to their Market-Market branch a couple of times, usually with my brothers and cousins. they love boodle feasts. :p i’d enjoy it on a picnic or by the beach but not in a restaurant. Haven’t tried this yet, cool concept! that is expensive…daming rice! lol still, am drooling just looking at the shot!